A friend of mine, fine artist Jeff Brimley, kindly agreed to stop oil painting for a moment and design a Shadow Warg for me. John Rocco, illustrator of Percy Jackson and the Olympians, did the artwork for Return to Exile, but wasn't able to create artwork for each individual monster due to time constraints and a late request, so I asked Jeff to help out. Shadow Wargs are one of the first creatures Sky Weathers encounters when he returns to his hometown of Exile in book 1 of The Hunter Chronicles, a book which is aptly named Return to Exile (see how that's done?). 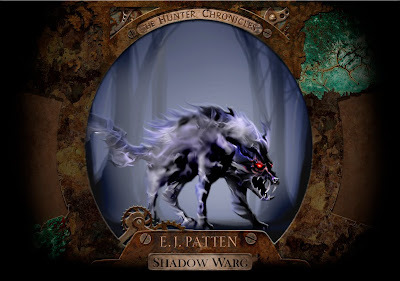 Here's a description of a Shadow Warg taken from Sky's Hunter Journal which can be found in the back of the book or online at www.returntoexile.com (it's the button on the right of the circle). For reference, I've compiled some notes on a few of the monsters I've come across, read about, or heard about so far. While I've included a few survival tips, your first, and best course of action is always to RUN. I mean it. Flee. Vamoose. Hotfoot it out. Shake a rug. Just get out of there. If that doesn't work, try a friendly "hello"; it won't help at all, but at least you won't die impolite. Shadow Wargs are hunters who have made a pact with a Wargarou: the hunter agrees to become the Wargarou’s minion and, in exchange, the hunter gains the ability to shift into a Shadow Warg. Shadow Wargs are Clydesdale-sized, wolf-like, and very annoying. They are made of darkness, can slip between shadows without being seen, and are practically invulnerable. The Shadow Wargs of Whimple mentions three weaknesses: silver, fire, and wolf’s bane. END JOURNAL TRANSMISSION (okay, this doesn't really make sense, since Sky's journal is hand written, but I've got to transition somehow, so give me a break). Return to Exile focuses on about ten unique creatures you've never heard of. These creatures include: Shadow Wargs, Wargarou, The Jack, Dovetail, Gnomon, Edgewalkers, Echo, Whisper, Glooms, Piebalds, and the most terrible of them all, The Arkhon. The mythology in Return to Exile includes dozens of creatures that will appear over the course of the series, and each one is every bit as detailed as a vampire or a dragon, which, by the way, DON'T appear in the series due to their having been killed off years earlier by their own popularity. Look for more concept art here in the coming weeks, assuming I can convince Jeff to put down his brush again. If you've got a favorite monster from the book that you'd like to see illustrated, let me know! You can find more of Jeff's artwork (not for the book) on his website and on Fine Art America. The artwork is beautiful. I love it. I'm shwoing my son when he gets home! Very cool. Ask Max if there are any monsters from the book he'd like to see drawn up. Hi Andrea! The descriptions of most the monster hunters happen on page 89 or so. A kid, stick-figure thin, emerged from behind a pile of rocks farther along the cobblestone road. On his head he had a cowlick called the “double crown” by haunted hairstylists the world over. He wore a white dress shirt—unbuttoned at the top—glossy black slacks, and thick spectacles that clearly labeled him as a member of the “out” crowd. Sky turned and saw a giant step out of the trees—not a literal giant, of course, just a very big kid. The newcomer looked just a little older than him, but he was bigger . . . much bigger. He stood nearly as tall as a Shadow Warg and looked to weigh nearly as much. He had mocha skin, like an islander, and he wore a Bahamas’ button-down, brown leather sandals, and Bermuda shorts, despite the cool weather. Hands looked a year or two older than Sky and a few inches taller, though not as tall as T-Bone. But where Sky was neither athletic nor flabby, Hands was most decidedly athletic. Hands stood, cool and confident, in a designer polo, expensive shoes, and banged-up jeans, but where the holes in Crystal’s jeans looked earned over many long years of wear by much bigger people, the holes in Hands’s jeans looked purchased. Instead he found a bright-eyed brown-haired girl stuffing something into her backpack as she exited Phineas’s property. She looked to be about Sky’s age, and her clothes were black, somewhat frumpy, and very baggy, like hand-me-downs that had been first worn and then trod upon by elephants. Large ears poked out from beneath black hair, which was getting long enough now that it spent as much time in his eyes as on his head. His eyes were brown and boring, and his nose was pinched at the top, rounding into a little nub at the bottom that looked like a turnip. His face was oval and pale, like he’d had all the blood leeched out of him. He was skinny, but not horribly so. Hannah liked to compare him to an onion, not because he resembled an onion in any way, or because he was particularly complex. No, she liked to compare him to an onion because onions stank, and sometimes she was just not very nice. I'd love to get some illustrations of the main characters sometime. I'll add it to the list!